With Their Finest, Gaby Chiappe and director Lone Sherfig have created a superb dream of a long ago time. Against the backdrop of England under attack in 1940, they show us the British living their daily lives calmly, interrupted repeatedly by air raid sirens that send them to underground shelter. At the center of it all is actor Gemma Arterton as Catrin Cole who carries the story with absolute calm and sharp intelligence. In this dark time of the German air raids, a group of writers gathers each day to make movies to aid the war effort. What can they do, they wonder aloud, to help lure America into the war at just the time when the battle of Dunkirk has told Britain they are not strong enough to win the war against the Nazis. They will make a movie about Dunkirk. Ambrose Hilliard (Bill Nighy), the aging matinee idol whose ego grows more fragile in the face of anyone else’s success, is temperamental but determined. 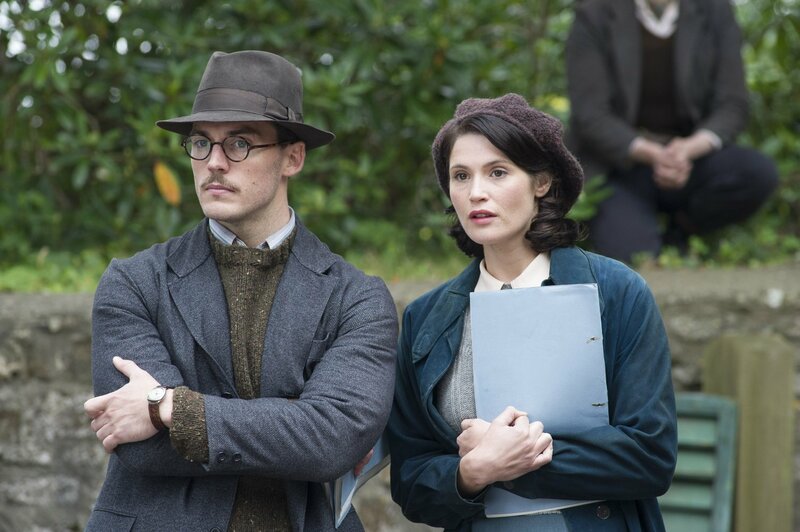 He and Buckley (Sam Claflin) hire Catrin (Gemma Arterton) to do secretarial jobs that will free them to write. Repeatedly, Catrin delivers several pages at a time that convince them she must be the main writer with Buckley. Making their movie is the core of the plot but something much deeper than that sinks into those of us who are watching. We are silenced in admiration at their skill in creating time and place. Even the relationship developing between Carin and Buckley is minor next to the portrait they paint of London under daily bombings. The moment the sirens start, Londoners leave homes and jobs quietly for their nearby shelters where they sit in silent acceptance until the all clear sends them back to work and home. We see the awful damage after each bombing and feel the impending loss of their country. We think again about Churchill’s prolonged visit to F.D.R. that was so key to America’s entry into the war. What would have happened without that visit? This is a fine movie made compelling by texture. We feel the dark gray atmosphere, the silence created by fear, a capital destroyed by bombs, a leader determined to get help and a handful of sharp portraits of determination to survive. It stays with us because it is so quietly and carefully imagined by fine writers and actors and a director who knew exactly how to salute the quiet bravery of a city under attack more than seventy years ago. This review was posted on August 11, 2017, in Comedy, Drama, Romance. Bookmark the permalink.